Is your WordPress blog performing slowly on a fast hosting company? It could be because of your bloated WordPress database. This can be fixed with a good database optimization plugin. When it comes to cleaning the database of WordPress, we have many great options like WP-Sweep, WP-Optimize, and WP-Db Manager. These plugins clear the overload, optimize the database & in-turn make your WordPress blog perform faster. However, none of them clean the unused tables, tasks & options left by plugins that you are no longer using. Do you know that even when you delete a plugin, it doesn’t clean everything that it added onto the database? I have already told you about deep-cleaning your WordPress database in an earlier post. Recently, I was working on optimizing my main blog’s (ShoutMeLoud) WordPress database & had to deep clean the orphan tables & options. Using existing plugins (such as Clean options) were not enough and I was looking for a free alternative. This is where I bumped into the Advanced WordPress Database Cleaner plugin which is available for free in the WordPress repo. 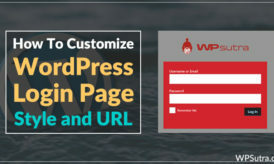 However, the free version is limited to features that are offered by other database optimization plugins such as WP-Sweep. They also have a premium version which made me purchase the plugin ($15 for one site or $30 for 5 sites). 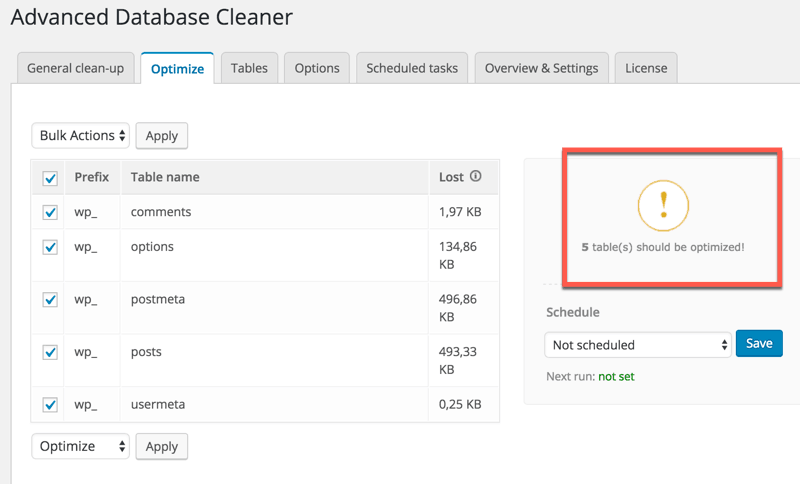 In this post, I will give you a detailed overview of the Advanced WordPress Database Cleaner plugin & show you how to use it. If you just want to test out the plugin with limited features, you can download the free version from here. If you are in the process of cleaning & optimizing a WordPress database (your site or your client site), purchase the Pro plugin from here. Do remember, it can take about 5 minutes to receive the email with your plugin file & license key. Download the plugin by clicking on the link in the email & install it manually. You can access the settings by going to Tools > WP DB Cleaner & input your license key to activate the plugin. 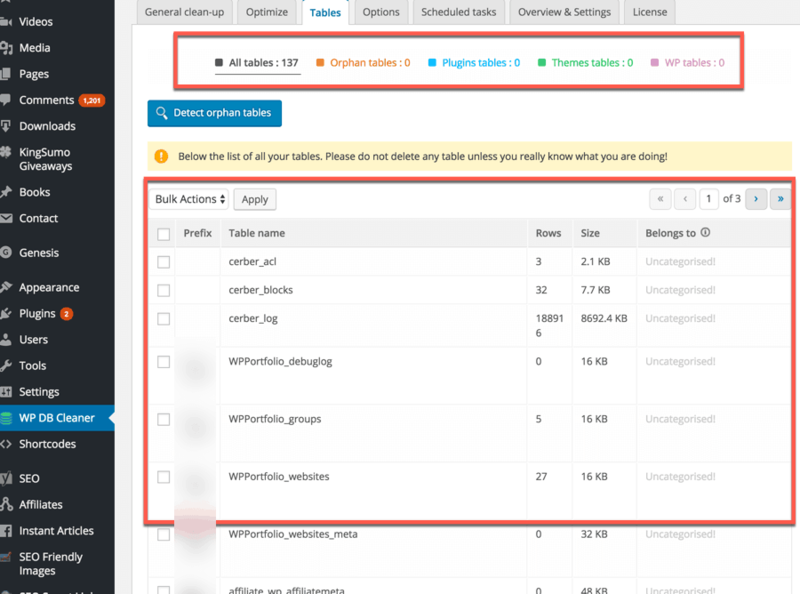 Upon activation, go to “Overview & Settings” to see the current status of your WordPress database. 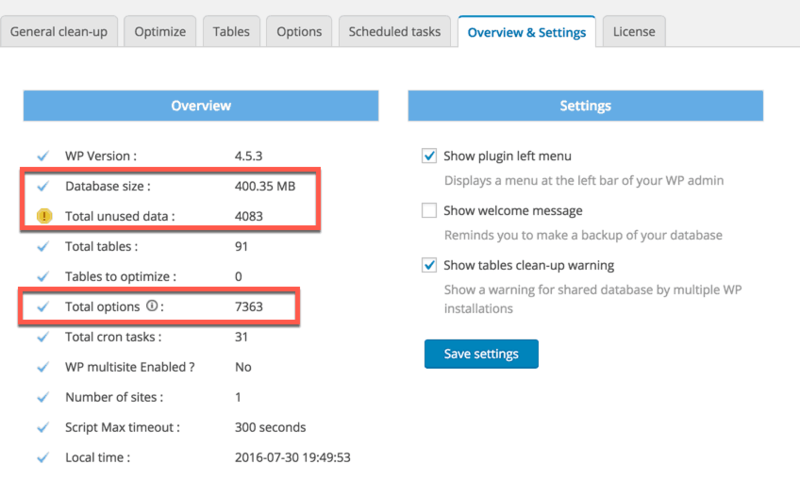 Hey, don’t forget to take backup of your database before starting to clean & optimize! Now, go to the “General Cleanup” tab & start the basic optimization. If you are not sure what to do, just use the settings as shown below. Once this is done, click on the “Optimize” tab to optimize the database. One good thing about this plugin is it shows only those tables which require optimization. Click on the “Tables” tab & click on “Detect orphan tables”. Depending on the size of your database, it may take a few seconds to show all of the orphan tables. 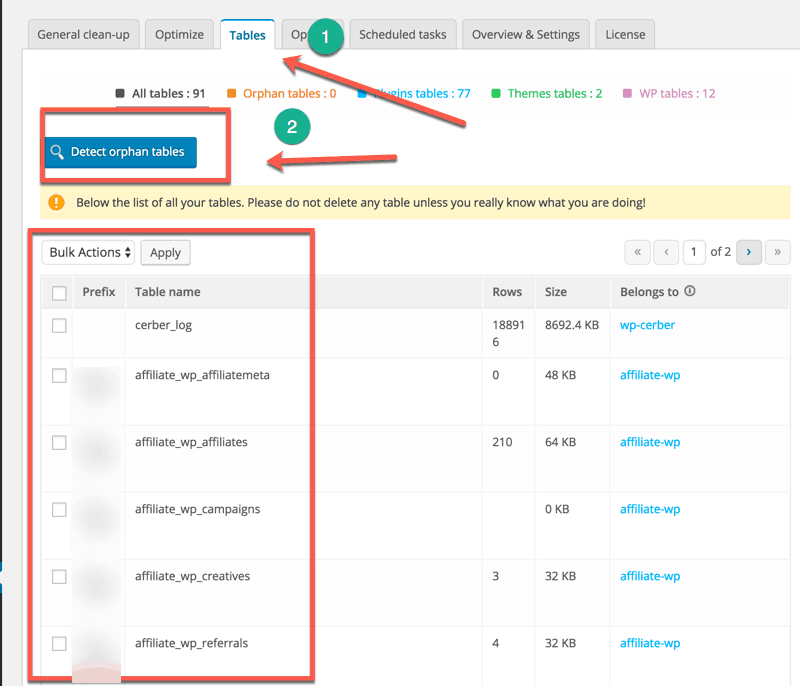 Now, click on the orphan table & you will see the table name which doesn’t belong to any currently installed plugin. 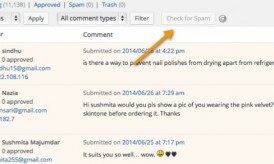 Warning: This feature is for users who are well aware of WordPress plugins & only for those who are managing their WordPress blog. 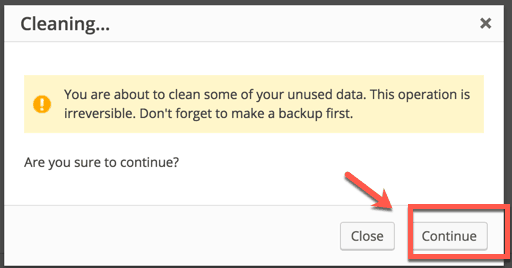 Nonetheless, do take a WordPress backup before deleting any table. 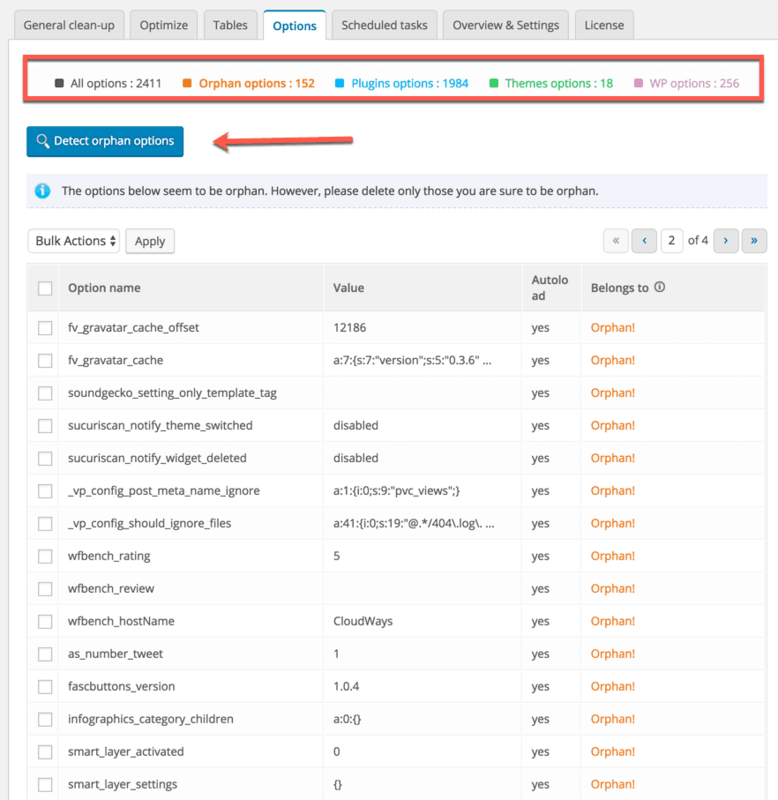 Now click on the “Options” tab & similar to orphan tables, click on “Detect orphan options”. And you can continue the cleaning process. 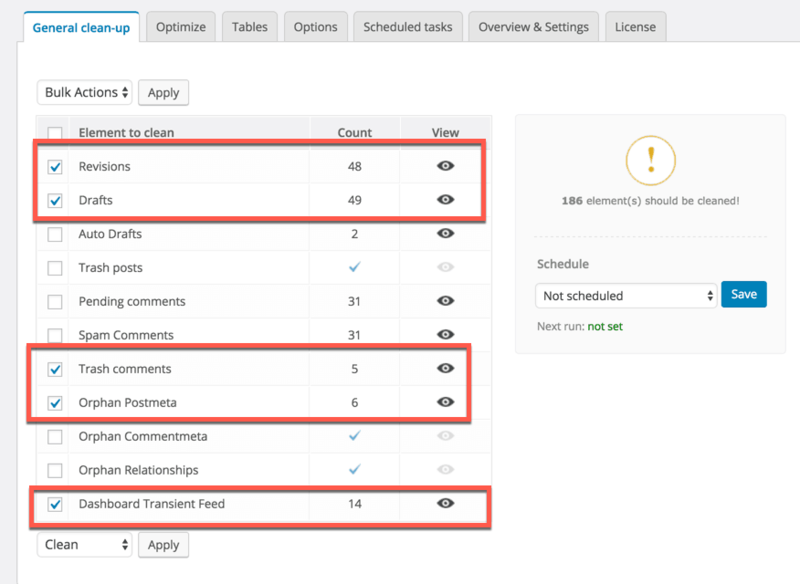 Here you can detect all scheduled tasks & like the last two options, use “Find orphan tasks” & start cleaning up. Once everything is done, you can simply deactivate the plugin. You should keep optimizing your database once a month & do a deep cleaning once every quarter. Do let me know which WordPress database optimization plugin you are using. If you are also a user of the Advanced WordPress Database Cleaner plugin, let me know your experience. You should also check out our WordPress plugin archive to find many other useful WordPress plugins. great article harsh, Thank you for sharing such a useful information with us. Thank you for this interesting post. Nevertheless I get some concern. Why do you recommend following: “Once everything is done, you can simply deactivate the plugin”. Why should we desactivate the plugin given that you recommend also to clean and optimize the database once a month and make deep cleaning every quarter? I do no longer understand well. @bdelMaleck The plugins that you use once in a while, it’s ok to keep them deactivated. You can enable again when you need to use it. This is to ensure plugins doesn’t interface into day to day activity. Do remember, I’m asking to deactivate the plugin & not to delete it. I love this blog. It’s amazing. Hi Harsh, I have just purchased the plugin through your affiliate link. But, I have one thought, please clear it. Do need to clean all orphan tables? You should clean as much as you could. Make sure you take a backup of database before using this option.